It has been way too long since I’ve blogged… way too long since I’ve cooked, actually, so last night, I treated myself to some long-overdue kitchen time and whipped up this healthful dish. A few weeks ago, one of our volunteers at Artlink prepared quinoa burgers for a luncheon I hosted and I loved them. I have never attempted to make them before and they turned out better than expected. I used his recipe with some minor adjustments. These burgers are extremely easy to make, so I prepared a bunch to have on hand the rest of the week. They store well in baggies. Place quinoa in a large bowl. Gently fold in flour (careful not to mush the quinoa). Add curry, eggs, onion, cheese, cilantro, salt, pepper and garlic powder. Gently mix until all ingredients are incorporated. Heat a cast iron skillet over medium heat. Shape mixture into patties and place in the skillet. Cook each side until golden brown (about 5-7 minutes per side). 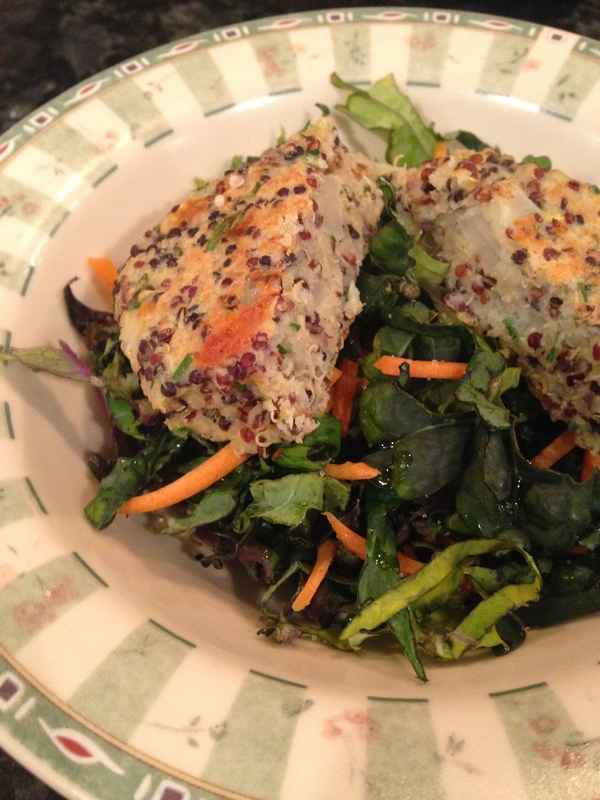 Place kale and carrots in a bowl, drizzle with olive oil, sprinkle with salt and top with quinoa burger.